Any player breaking into the NBA is going to be keen to make a positive first impression. However, when you are the number one pick in the draft, all eyes are going to be on you. Some players are able to rise to the challenge, using this intense scrutiny to fire up their play. Other players take a while to find their feet when they make the big step up. 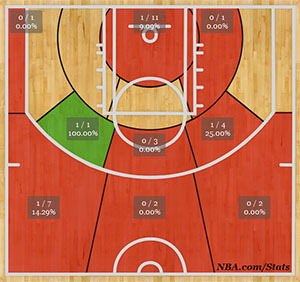 And then there is the story of Anthony Bennett at the start of the 2013/14 NBA season. It is clearly far too early to make any judgment on Bennett, who is also coming to terms with recovering from shoulder surgery. The pick by the Cavaliers was clearly one that was meant for the long haul but the nature of being first pick means that you are going to get all of the attention on you. Given that US sports fans love their statistics, it is these that people are turning to in order to make an early assessment on Bennett’s entry to the NBA. To be fair, it doesn’t look good. So far, Bennett is averaging 12 minutes per game and of the first thirty-two shots he has taken in his NBA career, he has only managed four of them! That’s a fairly poor ratio; in fact, it is a return of 12.5%, a poor ratio in anyone’s eyes. In this situation, you would hope to get off to a flying start but going 0-15 in his first four NBA games would have done little to spike the confidence of Bennett. He managed to get off the mark with a 1-5 performance in his next game but he was then on the court for just six minutes in his sixth game and he took no shots at all. Even though he is a rookie, he is a forward, and some forwards can rack up big points in six minutes of basketball play. In his seventh game, Bennett got seven minutes of court time and he went 0 for 1 in that time. In this situation, it can be difficult to know what a player should do. Obviously the key advice is to keep plugging away and to work harder. However, if a player focuses on his game more, sometimes it becomes even harder to play naturally. Some players get out a slump by shutting their brain off and not thinking about the situation. Bennett needs to work with his coaches to build up some confidence that will help him settle into games. He has taken a positive step by taking some twitter silence time, which should be a positive thing for the player. There is nothing wrong with twitter but as an athlete, it can expose you to negativity, which is not what he needs at this time. 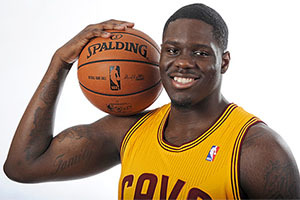 The Cleveland Cavaliers shouldn’t be too worried about their big signing just yet, but it is clear that they need to do some work with him to give Anthony Bennett the platform he needs to live up to his pre-season billing.